Flowering shrubs are grown in dozens of types, each shrub with its own distinct shape, color, size, growing requirement and blooming season. Many flowering shrubs require full sun and well-drained soil to flourish. Flowering shrubs may also be evergreen, meaning they retain their foliage and color when most other shrubs die down. Drought- and heat-tolerant, flowering shrubs create hardy and long-lasting plants to grow in the garden. The butterfly bush (Buddleia davidii) is a rapidly growing deciduous shrub with medium-to-coarse texture. The shrub's rounded, large form has arching branches that light up the landscape with color and texture. Gray-green to bluish green, leaves on the butterfly bush grow 4 to 10 inches long and emerge in late spring. The butterfly bush has fragrant lilac-like flowers that grow 4 to 10 inches wide and in a variety of colors including, white, yellow, pink and purple. Drought- and heat-tolerant, the butterfly bush is a hardy plant to prune in late winter to promote new growth in spring. Butterfly bushes grow 5 to 10 feet tall and 6 to 8 feet wide, ideal for growing at the back of a flower bed for a striking focal point to the landscape. As the name indicates, butterfly bushes attract butterflies and bumblebees to the garden. Butterfly bushes prefer full sun and well-drained, moist soil but grow in a wide range of soils. The butterfly bush is perennial in U.S. Department of Agriculture Plant Hardiness Zones 5 to 9. Gardenia (Gardenia augusta) is an evergreen bush with a moderate growth rate and medium texture. Gardenia shrubs grow 4 to 6 feet tall and 4 to 5 feet wide, ideal for a front flower bed. Dense in nature, the gardenia has a rounded, mound-like form. The whorled, lustrous, dark green leaves on the gardenia bush grow 2 to 4 inches long. The fragrant, summer-blooming flowers are white, grow 2 to 3 inches wide, and are often used in fresh floral arrangements. Gardenia shrubs are drought-tolerant, making them ideal shrubs to grow in arid climates. They prefer full sun to partial shade and well-drained acidic soil that is moist and nutrient-laden. The zone for planting is 7b to 10. The 'Annabelle' hydrangea (Hydrangea arborescens 'Annabelle') is a deciduous shrub with coarse texture and a rapid growth rate. The arching stems are upright and hold the puffball-like blooms. 'Annabelle' hydrangea bushes grow 3 to 4 feet tall and 3 to 5 feet wide, and are ideal planted in a perennial garden or in masses along a garden wall. The dark green leaves on the 'Annabelle' hydrangea grow 3 to 7 inches long. The fluffy, flat-topped blooms start off white and turn green, then brown as they mature. The flowerheads on this hydrangea grow 8 to 12 inches wide and are striking in fresh-cut floral arrangements. 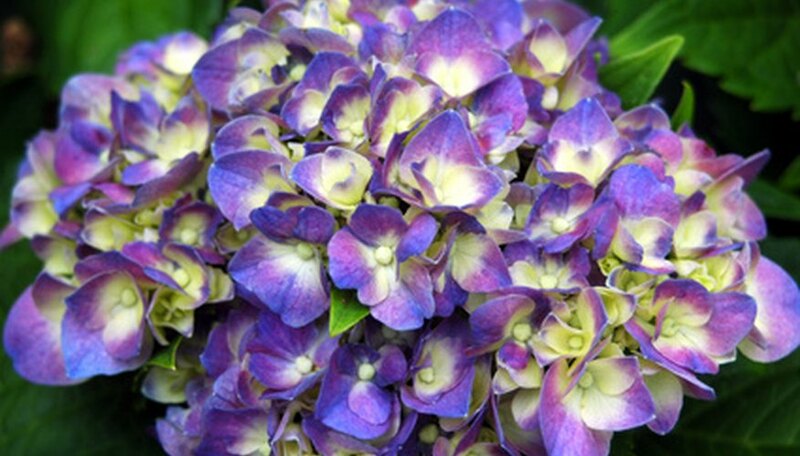 To promote flowering on new growth, prune the 'Annabelle' hydrangea in early spring. 'Annabelle' prefers full sun to partial shade and well-drained, moist soil. The zone for planting is 4 to 9.